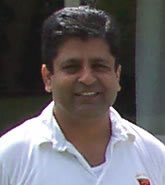 Natural cricketer Ken, takes on the 1st XI captaincy for 2010. Highly effective top order batsman Ken's subtle medium pace is probably underused - especially on the greener wickets. Like 2nd XI captain Pat Jones, Ken has shed a pound or 20 for the new season. Best of luck for 2010 to Ken and the boys.